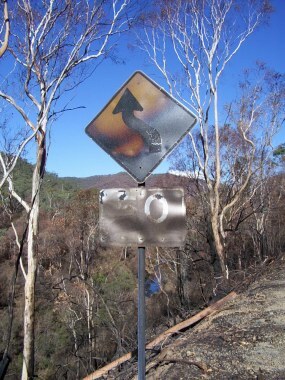 The following images were recorded around the townships of Dartmouth and Mitta Mitta on 15/03/2003. 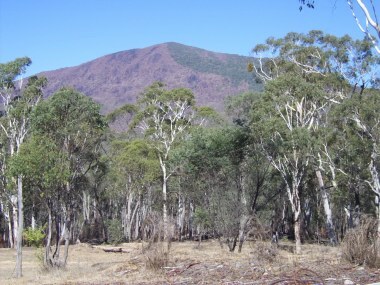 Pine plantation, Callaghan's Creek. A mystery why the whole plantation didn't get destroyed. 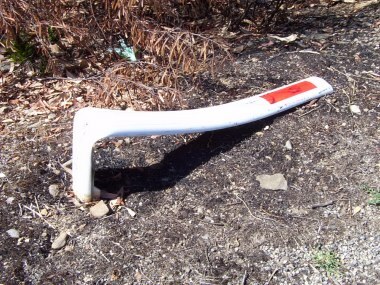 If you can't stand the heat.....this roadside post had no visible damage, but succumbed to radiant heat. The fires reached the water's edge at the Dartmouth Pondage. 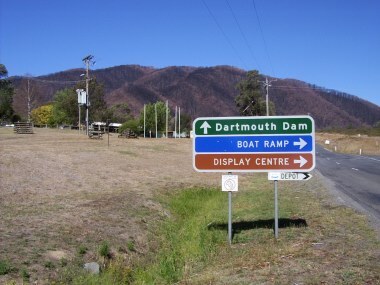 The outlet at Dartmouth Pondage. 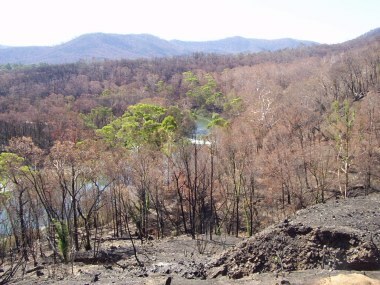 Fire damage can be seen on both sides of the Mitta River. 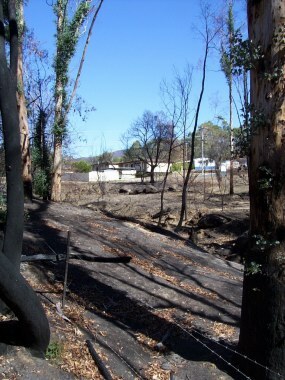 The hills behind the Dartmouth Caravan Park sustained considerable damage. 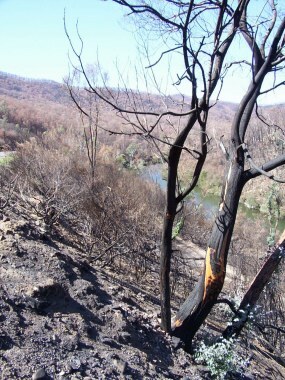 This illustrates how some trees were spared in the middle of the inferno. 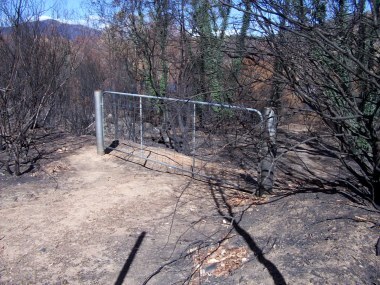 The fences on either side of this gate were completely destroyed. 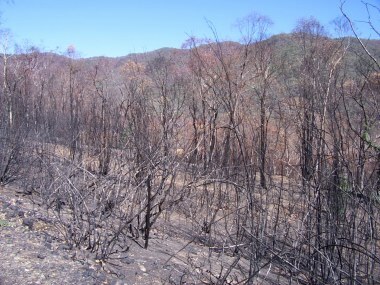 This hill near Granite Flat shows severe damage to the west of the ridge, and the east largely untouched. Snowy Creek near Granite Flat. 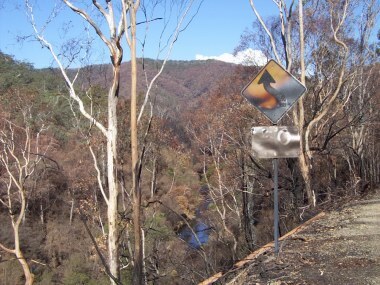 Taken from the Omeo Highway. Strong regrowth is evident in many of the trees near Dartmouth. 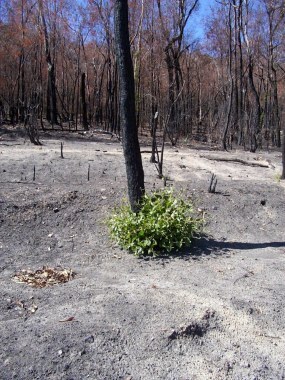 It has been less than six weeks since the fires raged, yet regrowth is strong. 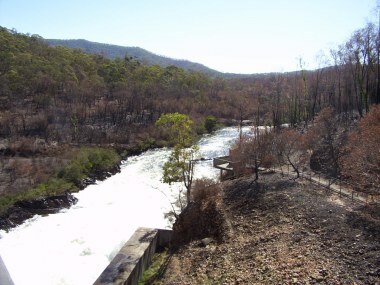 This view of the Mitta River between Dartmouth and Mitta is usually obscured by heavy undergrowth. A very lucky township. These houses were like many in Dartmouth, with the fire stopping at their doors. 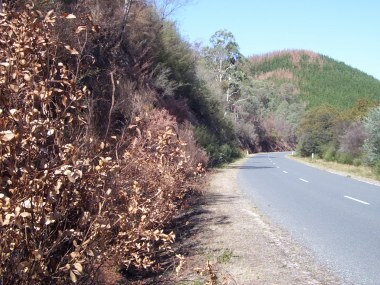 The firefighters who battled the bushfires around Mitta and Dartmouth did a fantastic job. There were so many seperate outbreaks to contend with, and all were contained with minimal property damage. When driving around Dartmouth township, I could only scratch my head and wonder how no buildings were lost. The effect on the fishery is uncertain at this stage, as we have not yet had any significant rains. 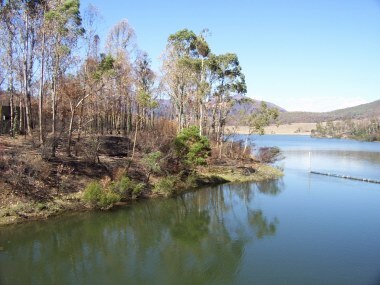 On the day I took these photos I hooked four trout in the river at Mitta Mitta, so for the moment the fishing is still good. 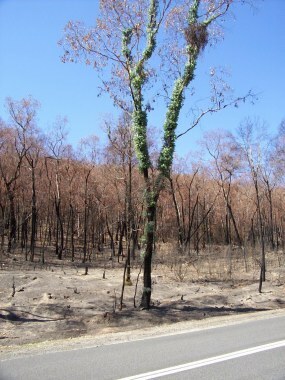 Some trees will never recover, but most areas are showing strong regrowth despite the lack of rain.